Bringing a child into the world should be a cause for celebration. And for many people, it is. But as millions of new parents find out every year, it's not enough to buy the diapers, put together the crib, set up the nursery and start saving for college. That's because across the board -- in single-parent to dual-income households -- the sky-high costs of child care are often overlooked. Recently, I interviewed Donna Levin, co-founder and vice president of operations at Care.com (CRCM), a company that helps connect caregivers with those looking for a helping hand. A Care.com survey on child care preparedness and its review of prior literature reveal a lot that expectant parents need to know -- but probably don't. Here are 10 surprising realities. Only 58 percent of expectant families create a child care budget before their baby is born. And even those who do have a budget don't do a great job of using realistic numbers. In the end, 75 percent of families interviewed said that they were "surprised or overwhelmed" by the cost of child care. 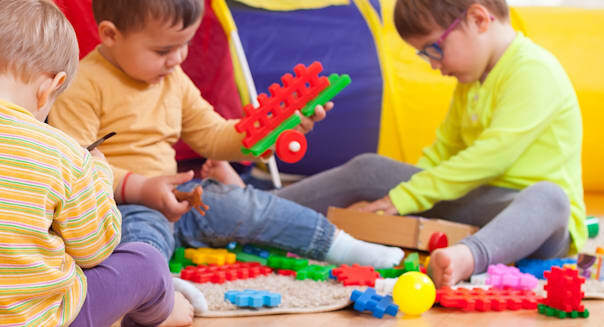 According to Childcare Aware of America, the cost of child care for two children in a center-based care facility was the largest family expense per year in every region except for the West (where household costs were slightly more). Averaged across the four regions, such care runs just over $18,000 a year. Childcare Aware of America compared the average costs of an infant in a child care center to the average costs of in-state tuition and fees at public colleges throughout the United States. 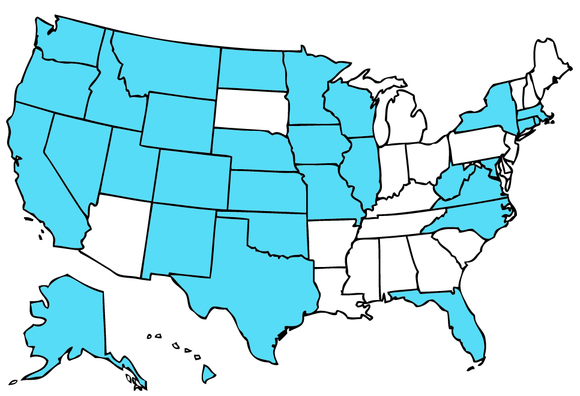 In the states shaded blue below, the costs of child care trump tuition and fees. Source: Author's illustration of Childcare Aware of America data. Family child care program: $6,604. 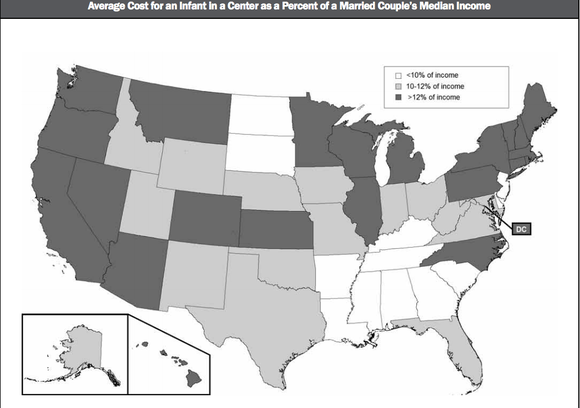 To control for differences in the costs of living, the graphic below shows how much of the average married couple's median income is spent on infant child care a year. Like most things, child care is more expensive in cities than in rural areas. Unlike other goods and services, however, the difference between the two is remarkable. For instance, in Oregon and Hawaii, the average cost of care for an infant is more than twice as expensive in urban areas as it is in rural ones. If each state that reported figures were weighed equally, the cost of caring for an infant is 35 percent more in urban areas nationally than rural ones. "Almost two-thirds of employers found that providing child care services reduced turnover," the Childcare Partnership Project said. And a study by the Childcare Action Campaign found that U.S. companies lost $3 billion annually, "as a consequence of child care-related absences." A whopping 83 percent of parents who use employer-sponsored child care benefits say it helps reduce stress and improve work-life balance, according to Care.com. The problem is that only 31 percent of employees take advantage of Flexible Spending Accounts to help defray costs. Other forms of assistance are also offered -- like on-site day care, reimbursements or memberships to services like Care.com -- but 76 percent of employees don't have access to it. More than half of U.S. families take advantage of some sort of tax break. FSAs allow employees to put away up to $5,000 in pre-tax dollars for child care. If your employer doesn't offer an FSA, then you can use the Child Care Tax Credit, which helps offset the costs of up to $3,000 for one child and $6,000 for two or more. According to Childcare Aware of America, 32 percent of children under 5 receive at least some supervision from grandparents during a typical week. Ten percent regularly get care from another relative, and 5 percent get care from friends or neighbors. There are other creative ways to reduce the costs of child care. Motley Fool contributor Brian Stoffel and the Motley Fool have no position in any of the stocks mentioned. Try any of our newsletter services free for 30 days.